With its renowned encyclopedic collection, why does the Cleveland Museum of Art continue to acquire works of art? The museum seeks out exceptional objects that help convey the stories of cultural achievement through time and across the globe to provide visitors with a more complete picture of our shared heritage. Such artworks invite us to ponder and better understand the world around us. Since 2014, the museum has acquired more than 2,000 works of art through purchase, gift, or bequest; this exhibition highlights 29 of these works, which were created for devotional, social, aesthetic, or practical purposes. Thanks to the generosity of our founders and donors, the Cleveland Museum of Art adds to the collection each year, acquiring objects that will pique your curiosity, stimulate your imagination, and perhaps even surprise you. In conjunction with Recent Acquisitions 2014–2017 in the focus gallery, the permanent collection galleries currently feature more than 50 recent acquisitions, each identified by a “Recent Acquisition” logo on its label. We encourage visitors to explore the museum and discover these objects. 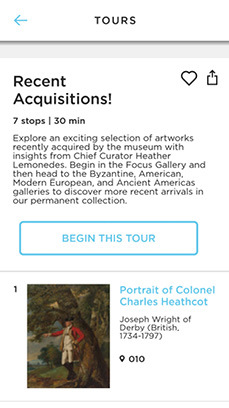 Three new features in the CMA’s free ArtLens App help visitors explore recent acquisitions. 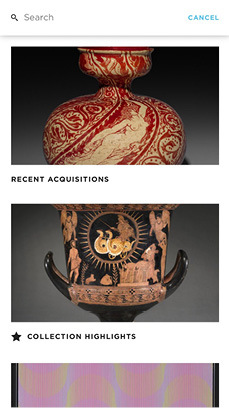 First, ArtLens now includes a Recent Acquisitions Feature that identifies all artworks acquired by the Cleveland Museum of Art in the past five years (since 2014). Within the app, press the search bar at the top of the main landing screen to find a scrollable list of all recent acquisitions; each object has images, information, gallery locations, and multimedia content. 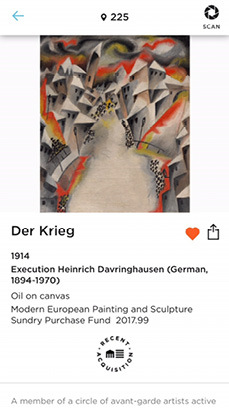 Second, if you are in a gallery, note that all recently acquired artworks include a “Recent Acquisition” icon on the physical label; push the Find Me button, and the new acquisitions in that gallery will appear at the top. Free, for iOS (iTunes store) or Android (Google Play).